An effective cancer treatment and cancer prevention technologies are currently among the main and topical issues of modern medical science, and numerous research groups are looking for innovative solutions to reduce cancer risks in modern people. The scientists are trying to find effective compounds or combinations of the compounds in order to prevent, stop, or at least slow down the development of cancer cells in human body, giving us a hope to receive a great cure for this terrible disease as soon as possible. Experts study the best known natural antioxidant and anti-cancer remedies like green tea, cocoa beans, broccoli, oranges, tomatoes, and others. Recently, a group of scientists found out that a compound extracted from broccoli can be a key ingredient for prostate cancer prevention therapy. It is reported that the experts at the University of Pittsburgh Cancer Institute (UPCI) managed to formulate a new approach, a anew treatment which can help in reducing risks for prostate cancer in men. The treatment is based on a special combination of broccoli extract and one known antimalarial drug. The research group carried out a series of experiments and found plenty of evidence not only to prove the effectiveness of the proposed formula, but also to start clinical trials of the approach which is supposed to be started in the nearest future. The report about this revolutionary study is scheduled to appear in the October issue of the journal Cancer Research, and the materials related to the study are expected to cause a great wave of interest in the world’s scientific circles. It is a known fact that veggies like broccoli, cauliflower, watercress, and others from the family of cruciferous have very strong links to reduced risks of cancer. The scientists are convinced that these effects are connected with the activities of sulforaphane, a phytoelement found in all of those veggies. After studying and testing sulforaphane in labs, the researchers could witness the amazing effectiveness of this element for preventing early-stage cancer cell formation. However, nothing could make sulforaphane work for slowing down or stopping the growth of a late-stage cancer cells (this is quite a known phenomena or natural mechanism called autophagy). That is how the idea of combining this substance with another one came to life. Having learned that antimalarial drugs like chloroquine can inhibit autophagy, the researchers combined one with sulforaphane and tested the formula on mice. As the further analysis has shown, only 12 per cent of lab mice developed late-stage prostate cancer after the treatment being tested. 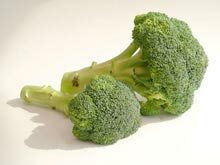 According to Dr. Shivendra Singh, the reported study leader and professor in Pitt’s Department of Pharmacology and Chemical Biology, the findings can lead to creating a new prostate cancer prevention technology, but he dis not recommend modern men combine consuming broccoli with chloroquine to reduce their prostate cancer risks. “Certainly eating broccoli and other cruciferous vegetables is good for you, but chloroquine can have side effects, and it has not been tested in humans for the purpose of preventing prostate cancer,” the researcher said.